Proposition: Gustav Niemann, as portrayed by Boris Karloff in House of Frankenstein, is the maddest of mad doctors of the classic Universal era. His problem is not that he is a vicious, amoral megalomaniacthat goes with the jobbut he is hopelessly unfocused and distracted. In a short 71 minutes of film time, he embarks on a number of conflicting plans and accomplishes only one of them. In organizational skills, he makes Dr. Phibes look like Martha Stewart. Many critics see this 1944 film as one of the least of the Universal horror classics because of its meandering plot; I propose that this perceived failing is the strength of this challenging film, for those who can see its true message. 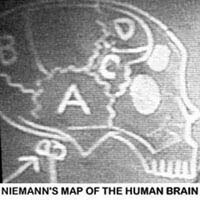 As the open-minded viewer witnesses Dr. Niemanns missteps, he is forced to ask himself: could I do better? Am I up to the task? Will I reanimate my hopes and dreams, or will my negative paradigm drag me into the quicksand? Drawing upon Stephen Coveys Seven Habits of Highly Successful People, lets take a critical look at Dr. Niemanns faulty principles of life, work and love. From the very start, Dr. Niemann is preoccupied with his past. He is an environmental determinist, driven by his feelings, not internalized values. He does not realize that he is responsible for his own life and that he must respond, not simply react, to situations. It seems that 15 years ago he attempted to put a human brain into the body of a dog (Plan A), and was imprisoned for it. He allows his resentment to control his actions. He chokes his jailer with a Universal Monsters One-Handed Strangle for taking away his chalk. He shows an unquestioning faith in the work of his brothers employer, Dr. Henry Frankenstein, “a genius in whose footsteps I will follow when I get out of here” (Plan B). Niemann and the hunchback Daniel are freed by a freak lightning bolt that crumbles the prison walls, and in a second mighty stroke of luck, they happen upon a passing traveling show that gives them refuge. The Seven Habits invites us to focus on our ultimate goalsa more comfortable home, a happier family, a fulfilling joband work step by step to achieve them. But Dr. Niemann lacks that focus. If his ultimate goal as stated is to follow in Dr. Frankensteins footsteps, he should make his way directly to the ruins of the castle where the doctors records were last seen in Frankenstein Meets the Wolf Man. Instead, he goes to Reigelberg to plot against Hussman. He is given another chance to act creatively. Through another stroke of fortune, he accidentally revives the deceased Dracula. But instead of allying with the old count, Niemann forces him, under threat, to help achieve his revenge (Plan D). Dracula, to his credit, adapts immediately to this idea, knowing it is compatible with his primary goal: breakfast. We never hear Niemann give Dracula his assignment, but Dracula has a clear objective in mind and acts quickly upon it. In less than 15 minutes of film time he plays out a Cliffs Notes version of his traditional storyline, infiltrating the Hussman household and wreaking havoc. Unfortunately, after killing Hussman, Dracula is distracted by his passions as well. His kidnapping of Hussmans daughter-in-law provokes a police chase. Instead of helping an ally in crisis, Niemann and Daniel betray Dracula, ditching his coffin, and the segment ends in Draculas death by sunlight. This failure should provide a lesson to Niemann in sticking to ones primary goals, but Niemann fails to grasp its significance. In Frankenstein Castle, Niemann and Daniel discover the Wolf Man and the Creature in ice. “Well set them free and theyll help us,” says Niemann. Thus he is expanding his Circle of Influence, but he is mistakenly assuming that the monsters priorities will match his own. He is operating in a win/lose paradigm, in which his plans come first. Niemanns dysfunctional listening skills are evident throughout the rest of the film. He gathers his allies, and a stray gypsy girl, and goes to his lab in Viseria. There, he sets out to revive Frankensteins monster (Plan B) by slow steaming: “The steam will soften the tissues so the high frequency current will go through them.” Meanwhile, his employee, Daniel, and his partner, Larry “Wolf Man” Talbot, are impatient for Niemann to solve their problems, but the doctors communication does not inspire confidence. “I have yet to find a way to combine Frankensteins technique with my own,” he tells the Wolf Man, vaguely, as an excuse to revive the monster. When Daniel begins to ask for Talbots body, Niemann interrupts him: “Forget Talbot,” and its back to Plan C (revenge). Now Niemann attempts to combine his goals, but they appear incompatible. He kidnaps his old foes Ullman and Strauss, Daniel doing the heavy lifting as usual. Then Niemann reveals his attempt to combine his priorities in a Plan F. “Kill my trusted old assistant [Ullman]? Why, no. Im going to repay you for betraying me. Im going to give that brain of yours a new home, in the skull of the Frankenstein monster. As for you, Strauss, Im going to give you the brain of the Wolf Man, so that all your waking hours will be spent in untold agony, awaiting the full of the moon, which will change you into a werewolf." The two goalsrevenge and scientific accomplishmentare incompatible here. 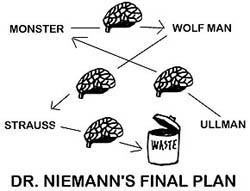 It seems obvious that Niemanns plan would end with his enemy Ullmans brain in a powerful monsters body, and the Wolf Mans personality transferred into another body instead of being cured. Instead of achieving synergy, Niemann has fallen into confusion. Here, Niemann betrays his Circle of Influence by his inability to make and hold to commitments. He also forgets the key to Production Capacity: “Always treat your employee (Daniel the hunchback) exactly as you want her or him to treat your best customer (the Frankenstein monster).” Because of Niemanns dismissive treatment, Daniel feels his efforts for the company in killing four men are not valued. He is disenfranchised, and tries to sabotage the enterprise. The employee (hunchback) beats the customer (monster) with a leather belt. The win/win paradigm implies an abundance mentality; there is enough for all. In the world of Universal Classic Monsters, there are plenty of brains and bodies for everyone, not to mention crowds of eligible gypsy dancers, but Niemann, Daniel and Talbot fail to recognize this. Furthermore, none of them are accepting of new ideas, or able to communicate openly, valuing their differences, to achieve a team effort. Their alliance falls apart. Niemann does not recognize Talbots urgency, as there just happens to be a full moon, so Talbot turns into a werewolf, and he and the gypsy dancer kill each other in a struggle. A fed-up hunchback tries to strangle Niemann but is tossed out a high window by the Frankenstein monster. Doing his best to help escape a posse of villagers, the monster accidentally drags Niemann to his death in the swamp. The characters in House of Frankenstein are far from straightening out their lives, so the question of “sharpening skills” is out of the question. Imagine how effective a mad scientist would be if he had focus and drive, and paid equal attention to the needs of mind, body and spirit. But typically, his mental skills are overdeveloped while his physical, social and spiritual skills atrophy. Examine your values. What is most important to you? Are your values in conflict with the values of your employees, your clients, or those villagers with the torches? Develop a mission statement. Is your top priority revenge? Reviving Frankensteins monster? Or switching brains from head to head? Act step by step, but do not react emotionally to circumstances. Be open to the ideas of your colleagues and monsters. Once on the path to your goal, do not become complacent. Continue to work on better communication and revisit your principles. And do not neglect your physical skills. A program of proper nutrition and exercise is recommended. The food and ale at the village inn is all right once in a while, but not as a steady diet. Also, instead of taking the horse and wagon every time, try walking to the cemetery and carrying back your “finds” in a handcart or backpack. Youll look and feel much better in the long run. The history of mad scientists in classic horror films is unfortunately a history of failure. Today, however, we have access to excellent advice, from Mr. Covey and others, to help us withstand the floods, collapsing castles, burning windmills and molten lava of life. We can only hope mad scientists of our time will find the advice that fits their lifestyles, and find fulfillment at last.